Good location bus Beach and shops close bye. Food okay but strange combinations at diner time. There were 3 diff pools, enough sun beds for everyone. Family friendly. 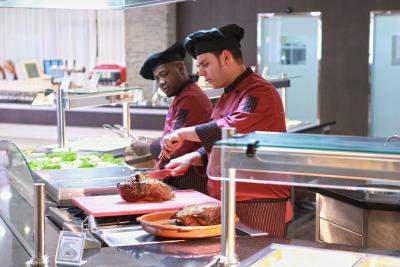 (1) Free food - breakfast, lunch and dinner is included and the majority of it tasted good as it was well prepared (*a chef grills the meat, poultry & fish right there on the spot and you can watch him/her do it). 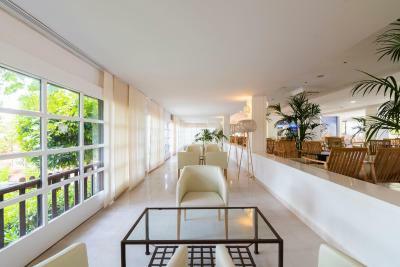 (2) This is the type of hotel that you bring your family plus Grandma, so everybody can have fun together during the day and at night you & your spouse can have fun enjoying the Ibiza nightlife while Grandma is watching the kids. (3) "David" at the Front Desk is awesome and is a great guy, he can speak ~ 5 different languages. He works very hard and is a consummate professional, he'll go far in life - no doubt about it. The hotel reception staff outstanding Especially Maria at reception Was very very helpful to me and my husband She moved us to a lovely room when we asked overlooking the pool , Food was really good and lots of choice We loved the roof top terrace . It was worth the extra to upgrade. The food was great, enough variety and choice each day. Staff was very friendly I liked the two pools: a smaller pool served as quiet area for adults, and a beautiful big pool. 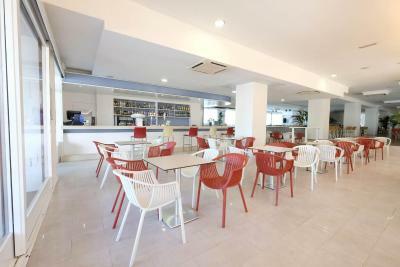 azuLine Hotel Bergantin This rating is a reflection of how the property compares to the industry standard when it comes to price, facilities and services available. It's based on a self-evaluation by the property. Use this rating to help choose your stay! 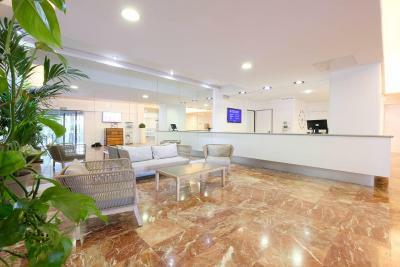 Hotel Bergantin is located in Cala d’en Bou, just 650 feet from S'Estanyol Beach. 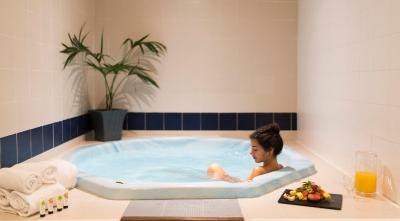 It features 2 outdoor swimming pools and a hot tub and sauna. The hotel has a fitness center, children’s playground, mini football field, and a tennis court. 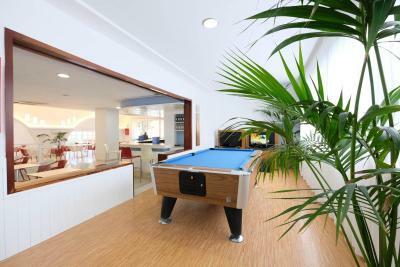 There is also a games room where guests can play billiards or table tennis. All air-conditioned rooms at azuLine Hotel Bergantin have a furnished balcony, some with sea views. Each room includes satellite TV, a safe and a private bathroom including toiletries. 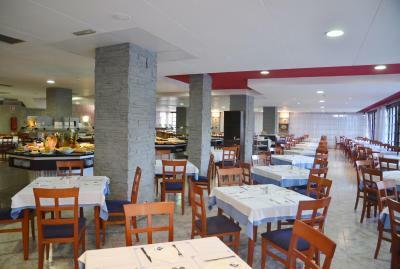 Located on the beachfront, the hotel's Sa Flama Restaurant serves traditional Mediterranean food. 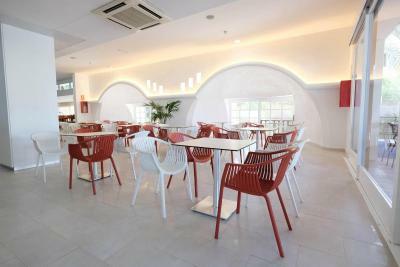 The dining room serves a buffet breakfast, lunch and dinner. Meals at Sa Flama are not included in the all-inclusive package. 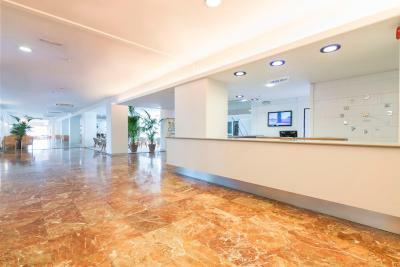 The hotel has a 24-hour reception desk and offers a car rental and ticket service. Sant Antoni de Portmany Ferry Terminal with crossings to Dénia is just 1.6 mi away. When would you like to stay at azuLine Hotel Bergantin? This room with air conditioning and heating features a private terrace. It comes with a satellite TV, a phone and a full bathroom. There is a safe available for hire. Wi-Fi is available for an extra cost. This air-conditioned room comes with a private terrace, a satellite TV, and a private bathroom. A safe box and WiFi are available at an extra cost. - access to the sunset terrace. House Rules azuLine Hotel Bergantin takes special requests – add in the next step! azuLine Hotel Bergantin accepts these cards and reserves the right to temporarily hold an amount prior to arrival. 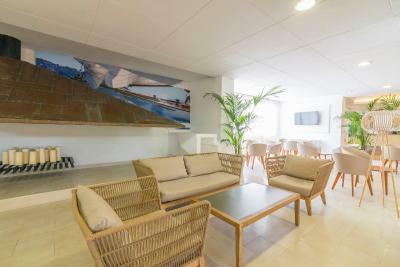 All-inclusive is only available at the hotel's onsite restaurant and includes the following: snacks, ice creams, soft drinks, liqueurs, apéritifs, house wine, beer and hot drinks. 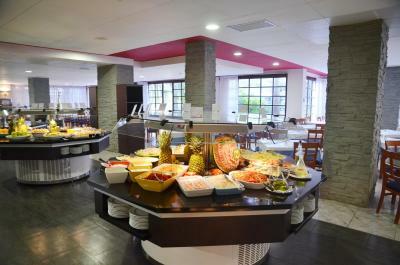 Meals at the hotel's tapas bar and restaurant on Sa Flama Beach are not included in the all-inclusive rate. Please note that the Garden Terrace services, the sunloungers at Sa Flama Restaruanta and the Sunset terrace services are available only from the 1st of May to 31st of October. The room was old,I don't know about the other rooms. The airco was very noisy, was dripping water and even ice! And it seems not to be working properly, had to drop the teperature to 18 degrees to feel any wind. The two lifts were very very small and very old. Needs to be replaced WiFi needs additional charge and was VERY slow. Couldn't even stream a show from Netflix properly. The Wi-Fi is advertised as being free, however this is not true... i had to pay 20 euros for the week Cash only. I believe this is not fair to advertise as being free. When i arrived the staff were not very helpful on telling me the times for breakfast dinner etc and where the facilities were. Guests tended to reserve sun loungers at the pool every morning with their towels which made it difficult for me to use them. Having to pay for Wi-Fi & pay deposit for Swimming Towels. 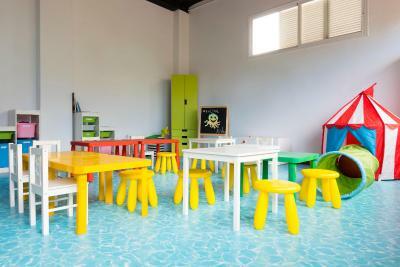 The pool area for kids. Kids falling every where no slip mats. The snack bar was old dirty and the food was just ok . The que for the pool in the morning was wild. Que for breakfast was the same couldn't get a table most morning as didn't have enough. Food was just ok. There was bad smell in the hotel. The roof top bar is the best part of the hotel without it I don't think I would have stayed there. Pay extra for the up grade it's so worth it as this is a very old out of date hotel.